Kirsty Fletcher is a Melbourne-based artist and architect. Her art works are predominantly small-scale cardboard sculptures and collage relief works, using reclaimed packaging and ephemera including metcards, beer cartons, cardboard boxes and salvaged objects. These materials are salvaged by Kirsty, her friend and family. They are saved from their recycling bin as well as found on the streets and the final works are a palimpsest of the current consumption patterns of the people around her. Conceived, in part, as prototypes for mass production, the creation process involves making a pattern and then hand-crafting something unique. She frequently produces multiple versions yet each has a look and personality of its own. 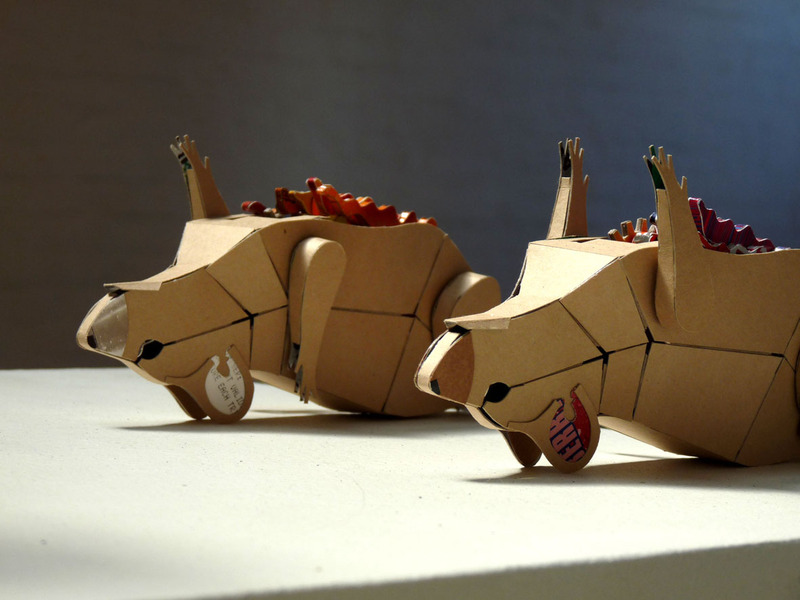 Despite the inert and flimsy nature of cardboard, the works are often kinetic or involve moving parts. The hand-made mechanisms are informed by pop-up book and wooden toy technology. Her ‘itty bitty kitty machine’ metcard sculpture was awarded a 2011 Linden Postcard Prize. In both 2009 and 2010 her works have been short-listed in the Togart Contemporary Art Award (NT) and the BSG Art Prize (Vic). She has had recent solo shows in Melbourne at Red Gallery and Brunswick Street Gallery. Her works have also featured in group exhibitions in Melbourne, Spain, Venice, and are included in numerous private collections. I have forwarded your message onto Erica. You should be able to find her on Facebook as well. I went to uni with her partner and we now work together. He says hello. Am glad you found her thru this site. Hello Kirst from Hobart, you good thing you. blown away by your site, saw B & E on the weekend and they told me about your blog. Have no immediate plans for another exhibition (a little exhausted from the beware show). Will, no doubt, get back into it in the next month or so and hatch a plan for a new show! I nominated you for the Illuminating Blogger Awards. If you would like to accept the instructions are here http://1stbar.wordpress.com/2013/03/13/illuminating-blogger-awards/. Great cardboard sculptures. I am a big fan and can’t wait to see what you come up with next!